Anyone who's ever watched Back to the Future will have a special relationship with the DeLorean. In the classic movie series, the car is the star. Doc Brown, one of the central characters, turns a DeLorean DMC-12 into a time machine. It inspired a generation of youngsters to want to one day own the car, despite the fact they were actually badly made and not very enjoyable to drive. Fortunately, the DeLorean has looks on its side. 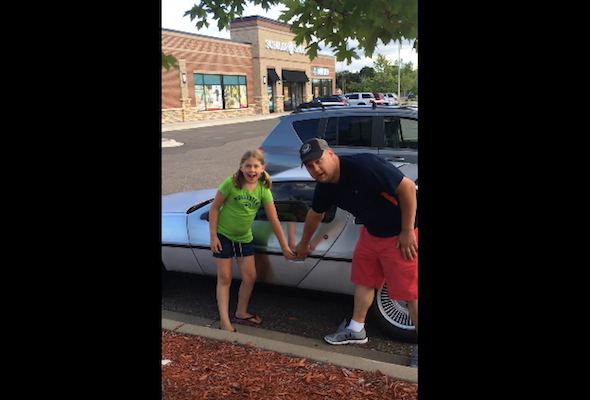 So when this little girl, who appears to have no prior knowledge of the car or the movies it starred in, finds out her dad has bought one, she loses her mind. Her parents clearly didn't tell her that they were going to buy the car and when she does find out her joy is infectious. Just try not to smile while watching this video!